Emphasising that system of online applications would soon be launched for forest clearances as well, Javadekar said there will be a given timeline and a maximum time limit for the approval process. 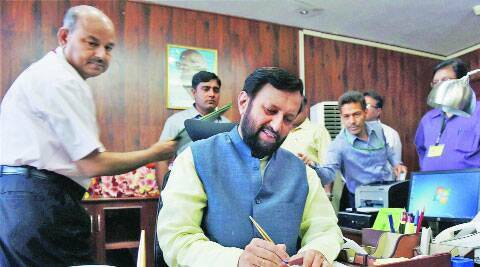 Promising faster and more transparent environment clearances for infrastructure projects, new Enviroment Minister Prakash Javadekar on Thursday said his government would strive to strike a balance between growth and environmental protection and ensure both are taken care of simultaneously. He added that “sustainable development will become the catchword” for the government’s efforts and that he will ensure environment becomes a “public movement”. He also said while development was “today’s need”, it was important to protect the environment for “future generations”. Javadekar said the ministry was starting online submission of applications for environment clearances that would ensure “transparency” and “real-time monitoring”. “It will ensure transparency in the application processes for environmental clearance and it would help online real-time monitoring and adherence to timelines for verification. It will also ensure stage-wise approval and compliance mechanism,” he said, explaining that under the new system, the applicant will have to register on the website, upon which he or she will be provided with a password. This, he said, would “ensure security” while maintaining “transparency between the ministry and applicant”.